Mother Nature created a spontaneous mutation in farm cats in Scotland resulting in the Traditional Scottish Fold. The breed was established by using crosses to British Shorthair and domestic cats in Scotland and England. The out cross breeds in America are the Traditional American Shorthair, the Traditional American Long hair, the Traditional British Shorthair, a Persian or two and a Burmese. Historically there have been prior sightings of folded eared cats. An antique Oriental wall hanging showing a folded eared white cat and her white kittens recently sold. Further reference was made in, “The 1975 Guide to the Cats of the World”, by Loxton, “The idea of a drop-eared Chinese breed was a persistent one.” The first known acknowledgement of this type of cat appeared in 1796 in the “Universal Magazine of Knowledge”, where they were mentioned as wild cats in China. 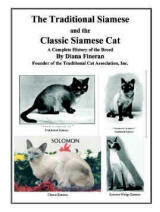 The “guide to the Cats of the World” continued, “A century late a sailor returned from China with a drop-eared cat.” No more documented evidence appeared until 1938 when a second drop eared cat was found. With limited genetic knowledge about the mutation at that time, it was believed the drop ear characteristic was limited only to white long haired cats, which was the coloration of all of the prior cats. Susie, a white barn cat, was the very first recognized and documented Traditional Scottish Fold, who all modern day, bona fide “Folds” trace their parentage to. The striking thing about Susie was her ears were folded downward and forward! She is the first folded eared cat discovered by William and Mary Ross, who were British Shorthair breeders, and the founders of the Traditional Scottish Fold breed. In 1961 William Ross, a shepherd, noticed Susie at the McRae farm, near Coupar Angus in the Tayside Region of Scotland, Northwest or Dundee. The Ross’s were told by the McRae’s that Susie’s mother had straight ears, but nothing was known about her father. One year later Susie gave birth to two folded kittens, sired by a local tom and both had folded ears. The male was given away. The Ross’s asked for one of Susie’s kittens and were given the folded ear, white, female in 1963, named her, Snooks, and went on to develop the breed from her. Three months later Susie was killed by a car on the road in front of her home. Snooks was bred to a red tabby male of unknown breeding. A male kitten named, “Snowball” came from her first litter and was subsequently bred to a white British Shorthair, “Lady May”. Their litter produced five folded kittens. In 1969 Snooks had her third litter of two folded kittens: Denisla Hester and Denisla Hector. Along with “Snowball” and “Lady May’s” kittens, the lineage expanded. Since the Den and Isla rivers flowed near their cottage, the Ross’s used a combination of the two rivers and named their cattery “Denisla. The newness of the breed brought the Ross’s to Pat Turner and the English geneticist, Pater Dyte, for help in progressing the breed through out crossing to British Shorthairs and domestic farm cats. “The Ross’s wrote to me in 1967,” Turner recalled, “At that stage they still referred to their cats as “lop eared”, after the lop eared rabbits.” Through this experiment Pat Turner produced seventy six kittens: forty two with folded ears and thirty four with straight ears. Pat Turner began showing her “folds”. 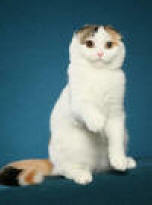 Originally call “Lops”, after the lop eared rabbits, the breed name became known as Scottish Folds in 1966. Breeding continued in Europe to preserve the rare mutation. Little was known about the natural mutation that causes the folded ear. Early in the 1970’s and English geneticist, Dr. Oliphant Jackson released a report stating the breed carried a bone problem, that no previous mention of associated skeletal deformity appeared before the 1970’s, and vital use of out crosses were needed to restore the original health of the breed! X-rays of “Folds” started showing bone lesions at that time. Questions arose about whether this was caused by early in-breeding or with the “fold” gene itself. In addition to these problems, many “Folds” originally had shortened tails that were inflexible. Help was sought from Dr. Rosemond Peltz, who offered, “in generations to come the undesirable defect may be diminished by extremely careful breeding.” More out crossing was used and the gene pool enlarged. Longer more flexible tails began to be produces and the shorten tails and bone lesions began to disappear. Out crossing remains a fundamental part of Traditional Scottish Fold breeding programs today. The stiff tail is eliminated by breeding a folded ear to a straight ear or an allowed out cross breed. 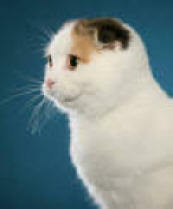 Due to mostly erroneous and unfounded allegations of possible increase in ear mite infestation, deafness and possible genetic difficulties, and due to the opposition from British Shorthair breeders who opposed the use of their breed, the British, Governing Council of the Cat Fancy (GCCF) closed and banned the Registration of any Traditional Scottish Folds in 1971! 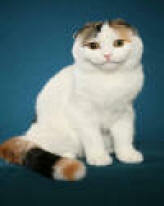 Denisla Morag was the last Traditional Scottish Fold to be registered with the GCCF! Mary Ross stated only one other cat lover besides herself were left breeding them in England at that time! No longer supported in their home country, except by a few loyal breeders, the Traditional Scottish Fold came to America in 1970 as research subjects for Dr. Neil Todd, a New England geneticist. At the Carnivore Genetics Research Center in Newtownville, MA. Dr. Todd brought “Denisla Judy”, “Denisla Joey” and “Denisal Hester”, who were three daughters of Snooks. Dr. Todd’s purpose was to gather a colony of cats for “scientific inspection of mutations”. None of his cats were ever intended to be part of the cat fancy. Under his watch full eye Joey and Judy produced two litters. Shortly there after, Dr. Todd lost interest, ended his research project and discipated his cats to various homes. Lynn Lamoreux, a doctoral student of Dr. Todd’s, gave “Hester” to Salle Wolf Peter, a Manx breeder in south eastern Pennsylvania. . One of “Hester’s” kittens went to an English couple in Utah in 1972. It was in Utah where the female, “Martina Shona”, owned by Briony Sivewright, was first shown. Early breeders involved with furthering the breed in the U.S. were: Ann Kimball, Bobbie Graham, Salle Wolf Peters, Jean Grimm, Lois & Clark Jensen, Pat Dreifuss, Shirley Norquist, Gay Turner, Nancy Aabbott, Bill and Patti Brubaker, Mary Auth, Chuck Payne, Donna Jean Thompson, Sue and Bruce Thompson, Junerose Wilkerson, Sharon Knight, Ken Burke, Kitty Angell and Karen Votava. “Mr Morgan LeFaye” a Cameo, Tabby Male, was acquired by Karen Votava. Together with “Doonie Lugs, “Mr Morgan LeFaye” became the foundation stock for Bryric Cattery. Famous cat names in Traditional Scottish Fold pedigrees are; “Jensen Minnie Pearl”, “Bryric Fanny Folderol of Kitjim”, “Bryric Patchwork”, “NW Kitjim’s Briarpatch”, “B4 Snow B-Ear-Y of Sweetums”, “Kitjim’s Buckwheat of Sweetums”, “RW Beebop Duke of Earle of Beepafold”, “NW Kitjim’s Bonny Too of Q-T cats” and, “Norton”. The Traditional Scottish Fold comes in both folded ears and straight ears and short and long hair. The use of Persians in early breedings helped establish the long hair gene. An incomplete dominant gene produces the folded ear. That means if a kitten inherits one gene for folded ears and one gene for straight ears, it most likely will develop folded ears. Also, if a heterozygous “Fold”, which carries a fold eared gene and a straight eared gene is bred to a straight eared cat about 50% or their kittens will develop folded ears. That ratio is said to increase to 75% if both parents are heterozygous ‘folds”. About one third of the kittens from genetically “Fold” to “Fold” breedings may develop skeletal lesions in the tail and hindquarters. Both folded and straight eared cats are used in breeding programs as invaluable bloodlines to further the breed. Since one of a breeding pair must have straight ears, the chances of producing a folded ear kitten in a litter are about 50% over a period of time. Not every litter will produce 50% folded kittens. A mixture of all straight ears, only one kitten with folded ears, etc. is the norm. Therefore, it takes great patience on the part of breeders who are involved with this breed. Despite being folded their ears are still expressive. Their can swivel to listen, lay back in anger and perk up when something interesting draws their attention. The fold in the ear can become less pronounced in illness, heat or distress. Kittens are born with straight ears that either fold or not by four weeks of age. All colors are accepted as well, so there is an infinite variety. Their cute appearance will win any heart. Their winsome, loving, intelligent disposition matches their sweet, open, hear-no-evil expression. With tiny voices, they are not extremely vocal. Human companionship is completely adored by them and they display this need in their own quiet way. Placid and calm “Folds” love to sit in your lap, cuddle with you in your bed, run to the door to greet you and are not finicky eaters. Sweet Tempered, devoted but not demanding, bouncy on occasion, but never boisterous, more likely to charm than to challenge they quickly endear themselves to your heart. They easily adapt to nearly all home situations from a single room to a large house, from a room full of children and dogs to a single person’s home. They adjust to other animals extremely well. Provided with great nutrition, a clean environment, lots of toys and generous amounts of love and attention they thrive. This breed is for those who love their gentle, open eyed look, sweet disposition and gentle calm nature. The Traditional Scottish Fold is a sturdy, hardy cat, true to their barn cat heritage. They lead long, healthy lives, often up to or past age 19. There is an unfounded misconception that they become crippled as they age. This, of coarse, is untrue! The long hair variety has a surprisingly easy care coat. A good combing once a week will suffice for most. Their hair lacks the downy under coat and doesn’t matt like a Persian’s will. 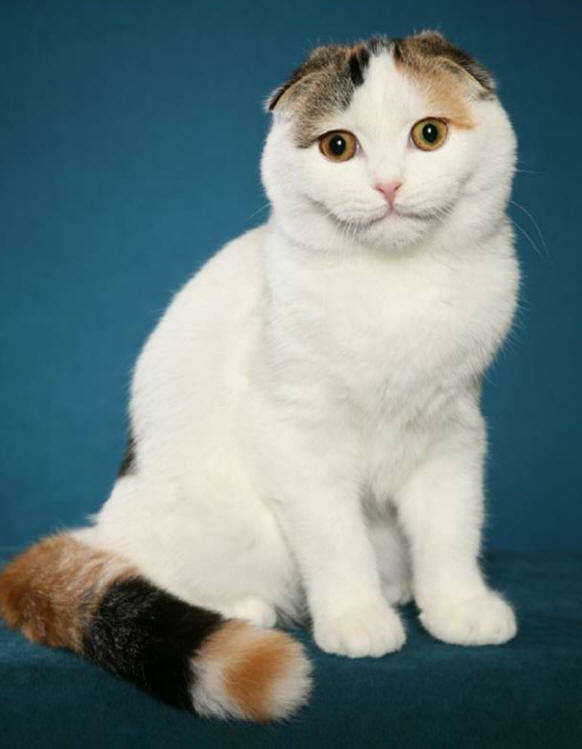 The Traditional Scottish Fold gene can cause thickening and crippling of the joints, particularly in homozygous “Folds”,(kittens who inherit two fold eared genes). This is called congenital osteodystrophy, a genetic condition that causes crippling distortion and enlargement of the bones. These anomalies are not life threatening, nor is the fold ear gene a lethal one. Careful breeding practices, avoiding “fold” to “Fold” breeding, reduces the problem.